A dirty little secret of photographers? No matter how big your camera is or how many years you have been in the field, anyone with a camera is still learning how to use it. My photographic journey has been a short but sweet one. I began photography simply to capture some beautiful pictures on my honeymoon. It wasn’t long until this journey paired me with one of my biggest passions; scuba diving. I am not an expert by any stretch of the imagination, but I’ll be honest when I say capturing breathtaking images is challenging. Combine that with scuba diving and the burden can seem almost impossible. Buoyancy control, navigation, a big bulky camera and strobes… These are among some of the many things you will need to manage if you choose to dip your fins in underwater photography. Get used to working with your camera on land, figure out the functions (they can be complicated, I know! ), and practice framing a subject. Once you add water and scuba diving to the mix things only get more complicated. 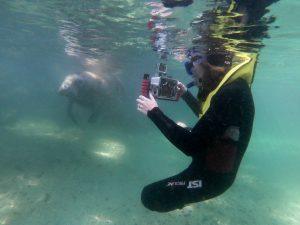 Once you feel relatively comfortable on land, try a few photography test runs in snorkel gear before actually donning your scuba diving equipment. 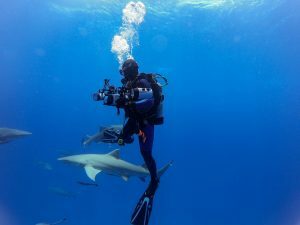 Underwater photographers are notorious for completely zoning out the world and focusing entirely on getting that perfect image, so please don’t forget about safety. Keep track of your air. As crazy at it sounds, 1 in 10 reported scuba incidents involve running out of air. Make sure to prioritize gas management OR if you have a dive watch, set an alarm to warn you when your tank reaches a certain air pressure. Watch out for hazards – animals, boats, currents, depth, safety stops. 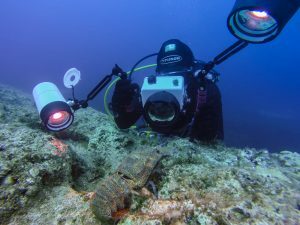 When you are buried under scuba gear and a big bulky camera, it’s easy to forget to keep your eyes open for hazards. For me, my dive buddy is really good at sticking close to me and being my eyes and ears when I am in the zone but that doesn’t mean I shouldn’t be doing my own environment and gauge check. Anybody can go snorkeling and see the dorsal side of a fish. Amazing and captivating underwater pictures are ones that photograph an animal from a different angle. When trying to capture that picture-perfect underwater shot, make sure to get eye level with your subject or even better get low and shoot up. If you’re shooting an animal, getting low will allow you to properly focus on the subject’s eye, and if you are shooting a marine landscape or wreck, you will be able to use some of the natural light to add an extra dimension to your picture. I’m not going to get into the science, but the gist of it is that water filters out light which in turn affects your pictures. Ever wonder why some of your gopro footage looks green or blue? The first light waves that you lose when you hit the water are your reds, oranges and yellows. The deeper you go in the water column the more colours fade away, the last one being blue. Having strobes is important to bring back those warm colours and breath life back into those otherwise blue monochromatic images when you are at depth. 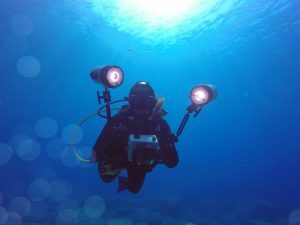 How to choose what strobes to buy? My advice is to get the highest powered strobes your budget can afford. Get close to your subject. Okay, now get closer. As stated in the previous point, shooting through water is tricky and you lose colour fast. The closer you are to your subject the better the colour will look in your picture. That, and it really helps bring your picture alive by filling the frame with the said subject. 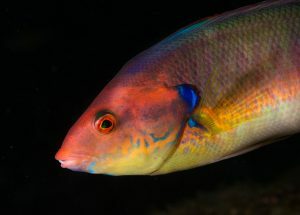 Check out this colourful wrasse. To photograph and bring out this guy’s colour I had to convince him to come within 30 cm of my lens. It was challenging, but with a little patience it finally happened. Photographs that tend to really capture the eye are ones where the subject stands out. When you’re in the underwater world it easy to find animals that blend into their surroundings. Instead, try to look for those lone rangers, the animals that swim to the beat of their own drum and stand out from the masses. 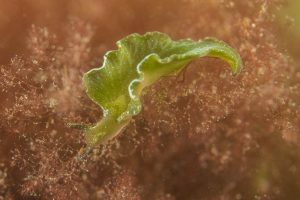 Take a look at this green nudibranch on a red plant background as an example of contrast. Nothing can ruin a perfectly composed picture faster than a good old dose of backscatter. For those who don’t know, backscatter is caused by flashes lighting up particles in the water. In your picture it will often show up as tones of little white confetti sprinkled all over your image. Backscatter can be caused by a variety of things – disturbed sediment, plankton in the water, poor positioning of camera strobes. The solution? 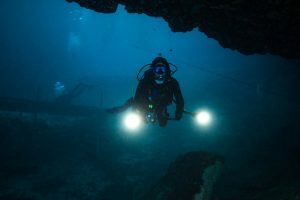 Proper buoyancy, good strobe positioning and avoiding a large dive group. Proper buoyancy speaks for itself in that underwater photographers need to make sure their weight is on par and they can comfortably hover just above the bottom without needing to touch anything. Properly situating your strobes includes having your strobes positioned far away from your camera housing and making sure that they are aligned behind the lens of your camera. It also doesn’t hurt to point the strobes straight ahead as opposed to having them angled in towards your subject. The more divers you have in your group the higher chances are that the bottom will be disturbed. Staying away from the large dive groups is a recipe for backscatter avoidance. This picture is a photo of me taking my camera out for the first time. As you can see the lights are not in an ideal position to minimize backscatter. Good luck, and remember to look around and have fun out there! From staring down a 300 lb sand tiger shark to currently being a certified PADI divemaster, Alisha Postma’s resume is jam packed with extreme water hobbies. A scuba diver, photographer and ocean activist with a background in marine biology, Alisha loves being underwater and the only thing she’s missing is a tail. Alisha and her husband Joey are plunging into as many strange and exotic waters as possible and they share their adventures on their scuba diving blog. Together they hope to promote ocean conservation and help the world understand what a beautiful place the aquatic realm can be. 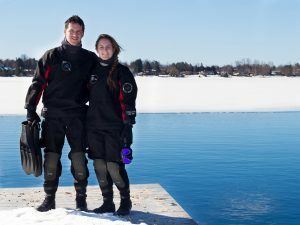 Connect with Alisha and Joey from Dive Buddies 4 Life on Facebook, Youtube, Twitter and Instagram.